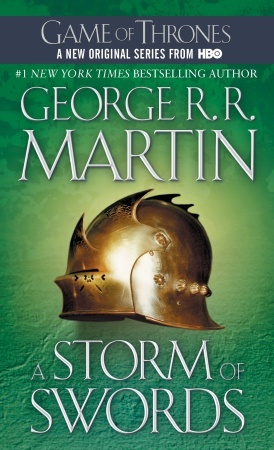 And so A Song of Ice and Fire series continues with the third installment, A Storm of Swords. I finished this book in late August / early September and—without going bit by bit through the novel—let’s just say I enjoyed it. It was a strong book and, page count alone, it is about 200 pages longer than A Clash of Kings. Of the five contenders for power, one is dead, another in disfavor, and still the wars rage as violently as ever, as alliances are made and broken. Joffrey, of House Lannister, sits on the Iron Throne, the uneasy ruler of the land of the Seven Kingdoms. His most bitter rival and Uncle, Lord Stannis, stands defeated and disgraced, the victim of the jealous sorceress who holds him in her evil thrall. But young Robb, of House Stark, still rules the North from the fortress of Riverrun. Robb plots against his despised Lannister enemies, even as they hold his sister Sansa hostage at King’s Landing, the seat of the Iron Throne. Meanwhile, making her way across a blood-drenched continent is the exiled queen, Daenerys, mistress of the only three dragons still left in the world. . . . But as opposing forces maneuver for the final titanic showdown, an army of barbaric wildlings arrives from the outermost line of civilization. In their vanguard is a horde of mythical Others–a supernatural army of the living dead whose animated corpses are unstoppable. As the future of the land hangs in the balance, no one will rest until the Seven Kingdoms have exploded in a veritable storm of swords. . . In short, here are some of my thoughts — SPOILER ALERT! It was interesting to pick up the book shortly before the end of A Clash of Kings, allowing us to see more of the battle in the Seven Kingdoms. Like the previous titles—A Game of Thrones and A Clash of Kings—A Storm of Swords follows threads from multiple characters, simply by titling the chapters after each narrator. While this was jarring at first (in A Game of Thrones), George R.R. Martin juggles the characters, chapters, and timeline incredibly well. I actually have grown to love it and often get excited—or saddened—when a particular character’s chapter begins or ends. I liked spending more time Beyond The Wall, specifically with Jon. I think that the ancient magic awoken in the Wilds is going to come crashing to the forefront quite soon. The Seven Kingdoms have been so embroiled in their ultimately petty war of succession that it would be apt for magic from Beyond the Wall to depreciate that battle. I also love how Jon really came into his own as a man and although his appointment to Lord Commander of the Night’s Watch was predictable, it was good to see. I was totally shocked when they killed off Robb and Lady Stark. I even flipped ahead thinking they were pulling another switch like with Bran and Rickon. While I’m not particularly saddened about Catelyn Stark, I did really like Robb as a character. It was really interesting in the previous books to see him grow into a man after the murder of his father, Eddard Stark. I am curious about Arya and Sansa. I would have thought that Martin would have killed Sansa off already, but I guess as long as Cersei lives, Sansa will too. I am so excited that Arya is going to Braavos and can’t wait to see what happens down that line. Jaime’s storyline with Brienne of Tarth was very interesting. It cast Jaime in such a different light and I think it really affected his character’s ego—taking him down a peg or two as well as being able to see the world from a different point of view, rather than from a privileged position as a Lannister and the Queen’s brother. Most fantasy works have an element of allegory to our world, but I think that Martin’s true gift is the level of humanity he instills in the books, despite the cynicism and death. Although it seems like the “bad” characters are consistently winning, they aren’t truly bad—such as we see with Jaime—and the “good” guys always seem to have hope.